Dubai, United Arab Emirates – Al Mawrid produces an incredible variety of packaging, including food packaging, bakery boxes, medicine boxes, perfume boxes, kraft boxes, e-flute boxes, duplex and food board printed boxes, PE-coated board printed boxes, special packaging board printing which can be used directly in oven and deep freezers. In 2012, Al Mawrid ordered its first Heidelberg inline flexo press. The combination of a Heidelberg ICS with an inline die-cutter Heidelberg FCL with a printing width of 670 mm was mainly meant for the production of cigarette packaging. With all indicators in the Middle East and Africa pointing to growth in packaging, Al Mawrid has ordered another Heidelberg ICS multi-process webfed press. The press, consisting of flexo and gravure printing units as well as a variety of converting modules, is expected to be installed soon. The modular wide web flexo unit to unit flexo press includes modules for cold-foiling, gravure printing, inline die-cutting and embossing. “The excellent flexo printing and value-adding quality of products that were printed on our first ICS excite our customers. 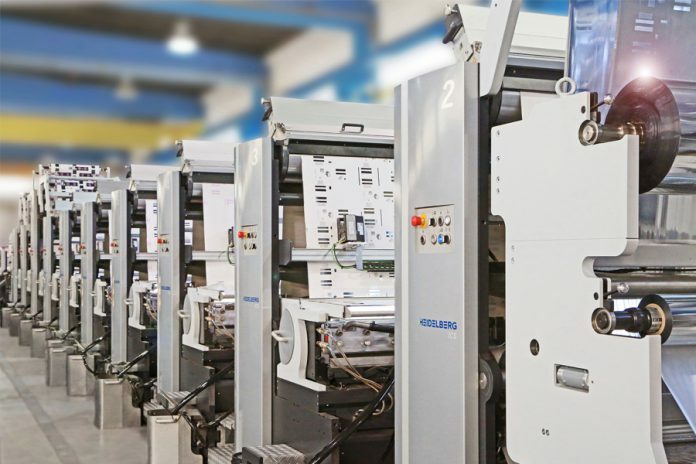 What we internally especially appreciate about the flexo printing press is the easy operation, low maintenance, combination of various printing and converting methods within one machine and the enormous output combined with reliability and high uptime,” explains Justin Ninan, production manager at Al Mawrid. One of the initial ventures of Thomsun group, Al Mawrid Printing & Advertising Industries is located at its own facility in Sharjah. Al Mawrid & Print House provides an array of printing and advertising services that are highly valued by the market place for their thrust on quality and timely work execution. Backed by state of the art technology, the division is driven by an experienced management and skilled workforce numbering over 350. In the process of delivering printing and packaging solutions, it has developed a stringent set of quality control measures that assures clients results as per the brief, as demonstrated by the awards in recent times.